Learning about franchises and what it takes to start a dream. The 9Round fitness franchise is a specialized fitness center dedicated to serving clients who want a unique, fun, and proven workout that guarantees results. At 9Round, we offer a kickboxing-themed fitness program that incorporates functional, interval, cardiovascular, and circuit training regimens. The programs consist of a proprietary system of nine challenging workout stations developed by a professional fighter. Tina founded Change Management Communications Center LLC in 2013 in order to help more businesses experience higher profits from their investments in change. Change Management Communications Center LLC provisions leaders with the skills and tools they need to be successful while leading others through change. The Center serves the New North Region of Wisconsin and beyond. The Centeris intentionally lean, project management savvy, and known for our ability to care for the human side of change. Change Management Communications Center LLC is a dynamic collection of premier talent designed to help leaders advance how they address change. 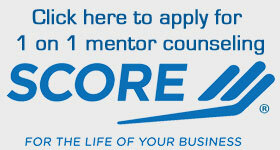 Looking at the things that are going on at Fox Cities SCORE and how you can become involved as a client or a mentor. Other SCORE Volunteers Terry Pinch & Brad DeBroux. This program is to help support female small business owners in the Appleton area. Through a competitive application process will provide one local femalel business owner with a $1,500 grant and over $2,000 in business coaching and networking opportunities. Learn about the goals of this program, what is involved and how to apply for this grant. Application deadline is April 26, 2018. Taking a unique business model and turning into a successful business. At Bagelicious, we specialize in New York Style kettle boiled bagels and many different homemade cream cheese flavors. We serve only the finest fresh sliced meats and cheeses from Boars Head Deli. We offer hot breakfast sandwiches all day, featuring real eggs, bacon, sausage and ham. We make signature deli sandwiches on fresh bagels, wraps or breads. We make salads to order, home made soups and cookies, fresh from our oven. We brew fresh locally roasted coffee, cappuccinos and make fresh smoothies. We offer catering for parties, special events and corporate meetings. Our dedicated staff members always put the customer first. We want you to have a memorable culinary experience every time you stop in. Learn more about trade with Mexico and the importance of the upcoming trip to Mexico in June to look at trading potentials. Find out how they can help local entrepreneurs. Starting and managing a non profit business. The vision of From Above is for teens to have a safe and fun place to go where they can discuss and deepen their faith. A place where true Christian friendships are developed. From Above is also a place for families to come together to celebrate, connect and grow. By having the students work in the bakery, it will give them life skills to help them in the future. To teach them how to work together, solve problems, take responsibility for their actions and to bring Gods love into the community and be a witness for Christ. Meet Brian Gottlieb, recognized as the Entrepreneur of the year by the Fox Cities Chamber and Entrepreneur of the Year from the Post-Crescent Annual Report. Learn about growing your business by using media and public relations effectively.